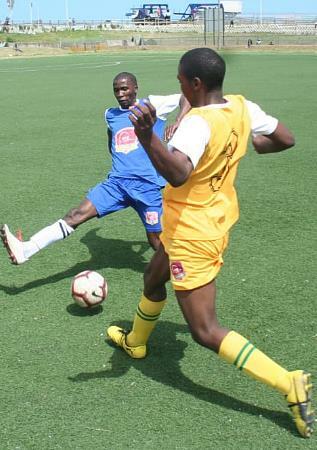 A Young Blues player (blue/white) blocks Paris United winger Mandlenkosi Prusent on attack. 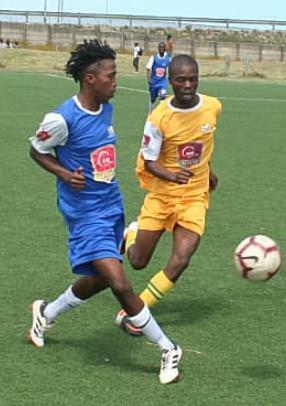 GEORGE NEWS - The Lawaaikamp-based Young Blues suffered a humiliating 4-2 defeat at the hands of Paris United from Thembalethu on Saturday 19 January at the Lawaaikamp stadium. The goals were scored by Anele Pungwana, Athenkosi Waganda, Mandlenkosi Prusent and Musona Bota for Paris United, and Athenkosi Buda and Thulani Zakade for Young Blues. With both teams disciplined on the ball in the first ten minutes, Paris put up a united front and used their wingers to penetrate Young Blues' back line, leading to the first score when Anele Pungwana broke the net. With Young Blues' Thulani Zakade and Sinovuyo Booysen struggling to defend against the strong wind, Vuyisa Dyonas and Mpho Joka controlled the game for Paris United, leading to another goal. Athenkosi Buda made his team happy when he opened the score for Young Blues, but Paris came back attacking, unlocking Blues defenders and striking goal number three. The first half ended 3-1, Paris United leading. In the second half Young Blues were looking for goals and got their opportunity when they were awarded a penalty. Thulani Zakade made no mistakes, breaking the net to make it 3-2. In the dying moments of the game Musona Bota put the cherry on the cake for Paris United when he scored goal number four. Paris United head coach Zolani Makendlana ascribed their win to the fact that the players kept to the game plan, turning on the pressure from the first whistle as the strong wind was in their favour, giving them an advantage in the first half. They also capitalised on the slowness of the Blues' wing backs and their observation that the Blues enjoy going forward and forget to defend. "Ja, our win against Young Blues means a lot because as a team we are in need of points, we are sitting in a dangerous position on the log standings. We want to be in the top 8," he said. He also thanked his players for their effort and commitment to the game and the fighting spirit they showed during the day.